Growing up, Lauren Redfern ’22 was always an athlete. She tried soccer, but came to love basketball and running cross country. While attending high school in the Dayton area, she was introduced to lacrosse and came to love that sport as well. 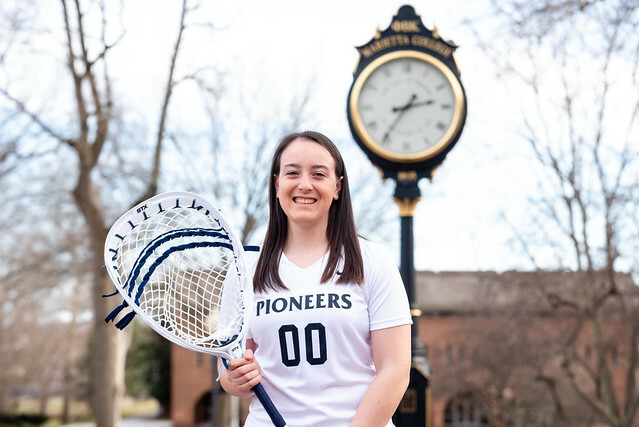 Now a freshman captain on Marietta College’s newly formed women’s lacrosse team, she’s hoping the College community will come to love the sport as much as she does. Introducing others to lacrosse is a familiar role for Redfern. She was on the first lacrosse team at her high school, too. While Redfern played point guard in basketball, she’s a goalie for the Pioneers’ lacrosse team. Both positions carry a lot of responsibility and require a lot of heart. But Redfern is used to tackling challenges. Her father is a member of the U.S. Air Force and while growing up, Redfern moved around a lot, living in Arizona, Texas, Delaware, Illinois, New Mexico and then Ohio. Dayton is where she spent her high school years, and that’s also where Redfern tore her ACL not once but twice. Her injury resulted in her missing out on the end of her senior basketball season and her entire senior lacrosse season. It’s one of the experiences that led her to choose her current major of Athletic Training. Injury isn’t the only adversity she’s faced. While in high school she was diagnosed with the sleeping disorder narcolepsy. This neurological disorder interferes with a person’s ability to control sleep and wakefulness. It causes overwhelming drowsiness and can also lead to sudden “sleep attacks,” which can occur during any type of activity. Redfern said she once experienced such an attack during the final seconds of a high school lacrosse match. Living with narcolepsy has taught her to be disciplined and listen to her body. She takes medication and naps as necessary throughout the day. She says sports and physical activity help, as does keeping to a routine. Dealing with narcolepsy made moving away from home a significant adjustment. Redfern credits her lacrosse coach, Malory Brunett, with assuring her family she would be in good hands. “She cares about her players,” Redfern says of Brunett. It didn’t take long for Brunett to realize Redfern would have a positive impact on the lacrosse program. Redfern is one of 14 freshmen on the team. Being named one of the team’s first captains is an honor, she says. And Brunett wants her to do just that. “Since we are a team comprised of mostly freshmen, I really wanted to name a freshman captain so the team would have a leader that was also a peer. Lauren was the perfect fit — she leads with a wonderful example and mindset, but also relates to her teammates,” she says. “Even though Lauren is just beginning her collegiate career, she understands early on what it takes to be a competitive team. Her captain role enables her to share that vision with her teammates. The Marietta College women’s lacrosse season kicked off Sunday, Feb. 17, with a home match at 11 a.m. In the weeks and months leading up to the season, Redfern and her teammates have been working hard conditioning and playing other teams in scrimmages and off-season leagues when they can. Sports continues to help Redfern find the balance she needs in life. She likes the fact that being an athlete and participating in sports holds her accountable, too.